The embattled governor of Virginia in the southeastern United States is declining to resign after the far-right unearthed a photo of a young man in blackface and another in a KKK outfit from his page in his 1984 college yearbook. Ralph Northam claims he never purchased a copy of the yearbook; and although he did dress up in blackface for a Michael Jackson costume, he's not the one in the costume. This poses massive problems for his Democratic Party, which is trying to look ahead to the 2020 presidential elections and replacing Donald Trump and his administration. Most Democrats are condemning Northam and urging him to resign and go away. President Vladimir Putin said Russia would start developing new mid-range, hyper-sonic missiles now that the US has pulled out of the Intermediate-Range Nuclear Forces Treaty (INF). Russia suspended its involvement in the agreement that has been a cornerstone of European security since Ronald Reagan and Mikhail Gorbachev signed it in 1987. In Washington, the US decision is viewed by many as Donald Trump's back-handed gift to Russian President Vladimir Putin, who for years has chafed at the restrictions on his missile development capability. 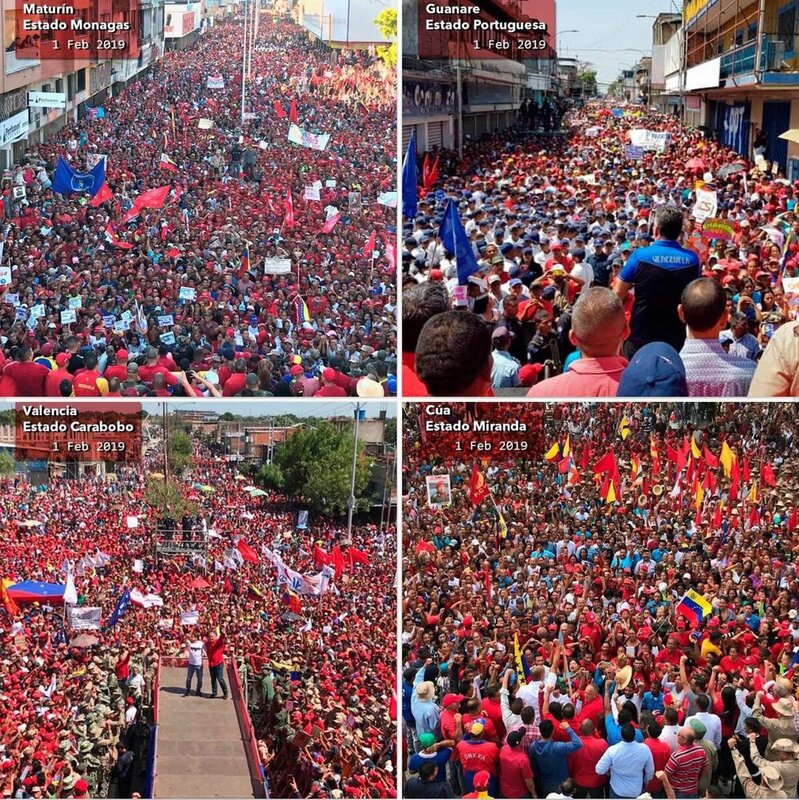 Hundreds of thousands of Venezuelans took part in pro- and anti-government rallies on saturday, although the pro- side definitely had the larger numbers as it marked the 20th Anniversary of Hugo Chavez's presidency. 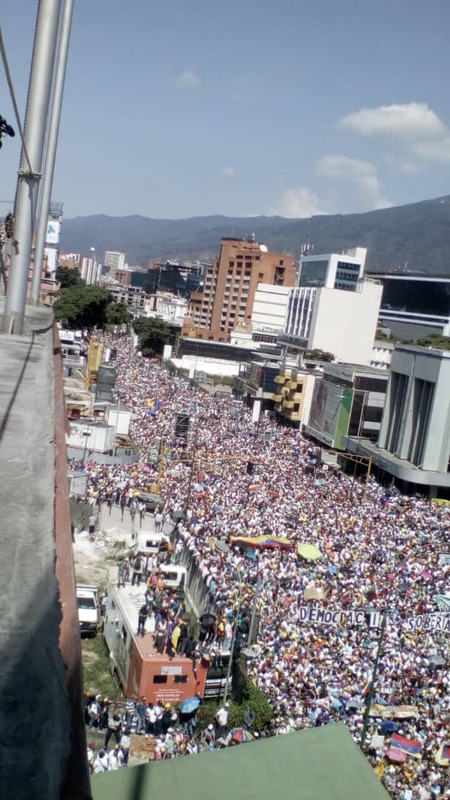 One big rally in Caracas featured the white-shirted supporters of opposition leader Juan Guaido, who declared himself president and got recognized by big Western powers.. 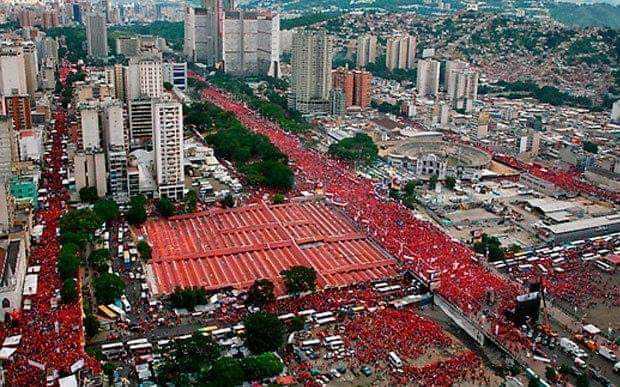 But the competing rally in support of democratically-elected President Nicolas Maduro filled streets with Red Shirts in the main business districts of the capital city..
..and in many other Venezuelan cities, too..
President Maduro accused the international corporate news media of "making invisible" the much larger demonstrations by pro-government supporters that have been taking place for several days. Speaking of people rising up against an unpopular government over its failed economic policies, the Yellow Vests returned to Paris, where they were greeted by French police with (say it with me now) Tear Gas and Water Cannons. But police did not use rubber bullets or flash rounds this time - because the protesters were led by Jerome Rodrigues, a Yellow Vest leader who is recovering from losing an eye to one of the supposedly non-lethal rounds last week. "They shoot at the population with a weapon of war," said Mr. Rodrigues, "Is that what France is like today? We just want to fill the fridge and we end up losing an eye." A French judge last week ruled that police can continue to use the dangerous and destruction rounds because of the threat of violence. A war-damaged apartment block collapsed in Aleppo, Syria, killing at least eleven people. The Syrian government has its work cut out for it repairing or replacing infrastructure detroyed or damaged during the lengthy civil war. UN satellite data from 2017 suggested that more than 35,000 structures in the city had suffered damage. Former Left-wing militant Patricio Ortiz Montenegro has returned to Chile after 23 years in exile, and a year after the government cancelled an arrest warrant. He had fought the fascist Pinochet regime and in 1991 was convicted of killing a police officer, but escaped from prison and fled the country. Dozens of supporters surprised him at the airport at Santiago, waving the Red Flags of his former revolutionary movement: "I return to my country. I return with dignity. I return after 23 years to re-unite with all my comrades. I am part of the resistance in this country," said Mr. Ortiz.